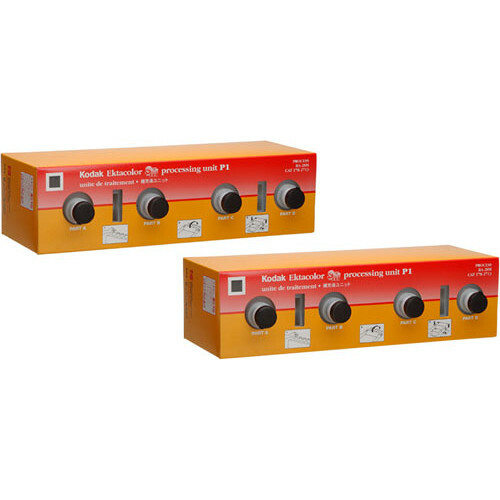 Kodak Ektacolor SM (RA-2SM) Processing Unit P1, is the first of two replenishment units for Process RA-2SM. Unit P1 contains the developer which chemically reduces the exposed silver halide in the film or paper to form a metallic silver image. At the same time, the color developing agent in the developer oxidizes and combines with the dye couplers at the site of the silver image in each of the dye-forming emulsion layers to form a color image. Once the dye image has formed, there is no need for the silver image. It is removed by bleaching and fixing. Kodak is committed to providing minilabs with chemicals that are safe, economical, and easy to use. Ektacolor SM chemical provide true SiMplicity. SM chemical concentrates are supplied in processing units that fit directly into the minilab; no mixing is required. Each of the four units F1, F2, P1, and P2 can only fit onto the minilabs in the correct location. The units are also colorcoded with corresponding colored labels on the minilab, and each unit has a unique symbol that also matches the minilab, to make operations simple for the operator. The chemicals designed for SM Minilabs are supplied in liquid concentrates for easy handling. Kodak designed these chemicals to be as safe as possible for our environment.